Let me explain how we ended up with one of the coolest paper crafts I ever played with. But before you read any further—please be advised—the Paper Cruiser is now exclusively and instantly available for our Patrons. Get the Paper Cruiser Now! I can’t remember exactly where I read those lines. Must have been on Twitter, I guess. 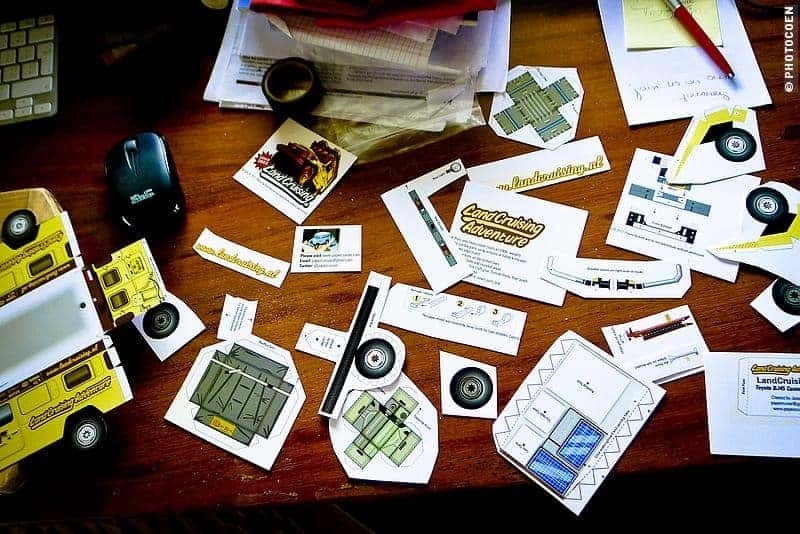 I started to investigate and got in touch with the man behind the Paper Cruisers: Jesse. He had been working on a Long Wheel Based Land Cruiser so I sent him some or our images to help him get more details on his paper model. Hey – Have fun with this. It’s very easy to construct paper roof racks, bumpers and things out of strips of black paper. If you get stuck, make another. The trickiest part are the front fenders. Print on heavy paper. Better yet, why not let them build a replica of our own Expedition Land Cruiser! I had a fairly good idea of what I wanted on there and started designing add-on items that typify our BJ45. I love the photos and I like the addition of the jack mounted to the side. Very good work on that. This then sparked various emails back and forth with images, ideas and improvements. However, I soon realized that my skills faded in comparison with the Paper Cruiser man and I was going to need a lot of hours to get where we wanted, so we made a deal that he would complete the model and I would compensate him for it. This way we all benefitted from it: generating some income for Jesse and I would get a high-quality Paper Cruiser. 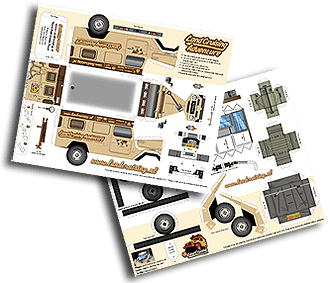 The second sheet for all the goodies and extra items that our Troopy carries was added to the package and we made a huge step forward with adding 3D wheels to give the Cruiser a better look, but also from preventing the model from sagging too much. Now our Landcruising Adventure Expedition Paper Cruiser is ready to take on the world. Wouldn’t it be great if you could build one too? Well, you can. It will be part of our Patreon content. What that is? Find out here and join us in this new adventure. We’d love to have you on board! Below I collected some tips and instructional videos from Paper Cruiser’s website. 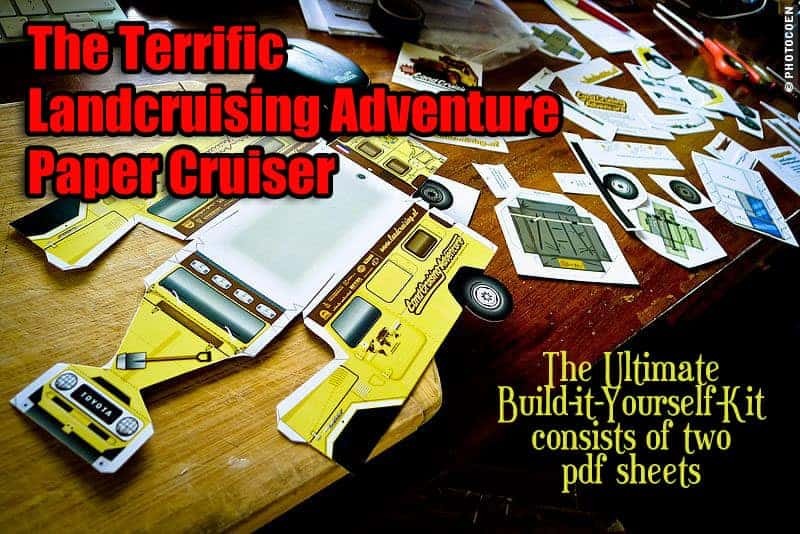 Did you know Paper Cruiser has recently made some free paper rock models that would suit the Landcruising Adventure Paper Cruiser perfectly. Get them here and be sure to check out the other free models as well. Print on heavy (card stock) paper. Cut out parts. Use a hobby knife and cutting mat (or another hard surface) for the small parts. Score all fold lines, pre-fold all folds before gluing. Use common white glue, spread thinly, and pinch until it sticks. Start at the back, begin to glue the tabs. When the body is complete, build chassis (if applicable) and glue to the bottom of the body. Use alignment arrows. Make fenders and wheels. Attach to body. Cut out and build bumpers. Attach bumpers. Cut out and attach the remainder of the small parts. With a matching-color marker, color the fold and cut lines for better appearance. 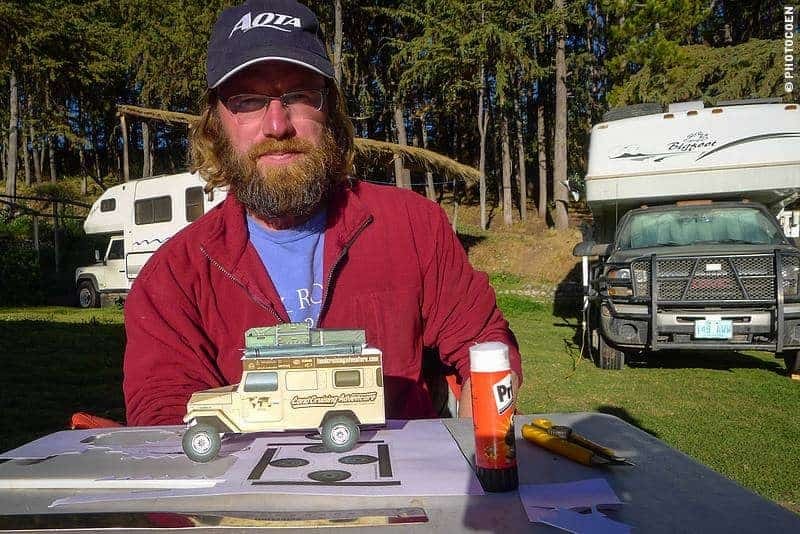 Demonstrating how to build the Toyota “LandCruising” BJ45 Troopy Land Cruiser paper model. How to cut out small parts demo: using a hobby knife instead of scissors. Where do I get this awesome wicked Paper Cruiser? The Paper Cruiser is now exclusively and instantly available for our Patrons. Hoi Coen. Even een snelle reaktie. Het is Glue met een G en niet met een C. (meerdere keren op deze pagina). Ziet er verder gelikt uit. Ik ga snel verder lezen. PS. Ik heb JP en Hanny ontmoet vorige maand in ons dorp. Hele leuke mensen. Hoi Ruud, dank voor je reactie. Typo is gecorrigeerd. Lees ze. Hi Peter, we’d love to meet you on the road one day. We’ll be around for a while on this continent. Seeing your car going through all its phases as you travel and enjoy the world has inspired me to restore and set up my own fj45 troop carrier to travel around Australia with my family. Hopefully one day you make it to this beautiful country I live in and run into each other on the trails. I’ve has Jesse make 2 custom models for me. The MAXTRAX FJ Cruiser and MAXTRAX Land Cruiser 105. I recomed him to every one I can and hope he makes one if the Rally Fighter next. These paper models are perfect for those of us who can only dream of these adventures! I know I’ll never be able to load-up a Cruiser and travel the back roads. The best I can do is sit at my desk and enjoy the adventures that other people are willing to share. This little Cruiser will may never get me out in the wild, but at least I can say I own one! I’d love to have a paper cruiser! Love your adventure, Happy Trails! 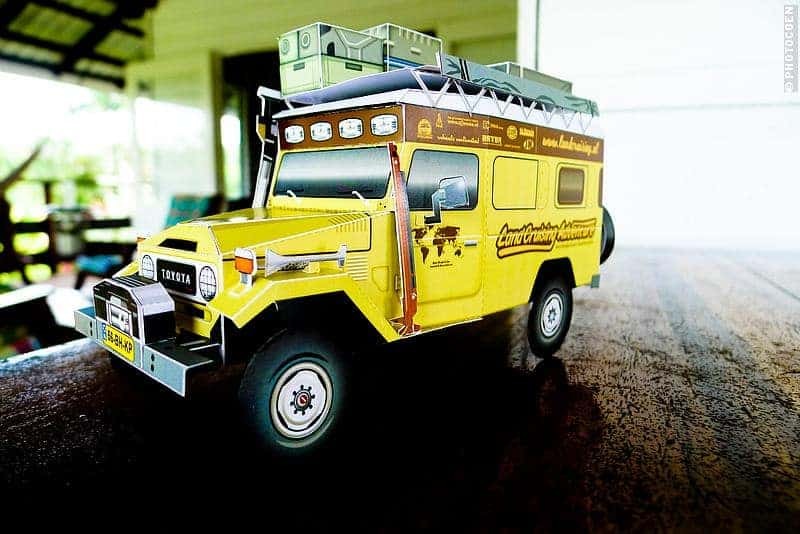 i am collecting the land cruiser paper models, love to have one of this! all the best… and spin the wheels! In building this model, I took a lot of pictures. It was a great model! That looks great! I’ve enjoyed building the papercruiser myself, but I see here that you are clearly a professional and perfectionist. I especially like the setting you have made with the rocks and dogs. Thanks a lot. I am slow to make very. To be able to make clean, I was very happy. WHERE DID THE TEMPLATES GO? Heya Ranbin, I’m sorry that we hid the link a bit. I now revised the post and made sure to include a big button where you can find the Paper Cruiser. Become our Patron [which you can be for just the price of a cup of coffee] and get free access to the Paper Cruiser, early access to all our drone clips and much more. I don’t want to get on patreon. Just do mediafire. Can you do this model a scale of 41 cm and 39 ft? Great, I didn’t know that. Did you build our truck yet?